Passing Pinwheels: We did it! I can't leave a grouchy post at the top. 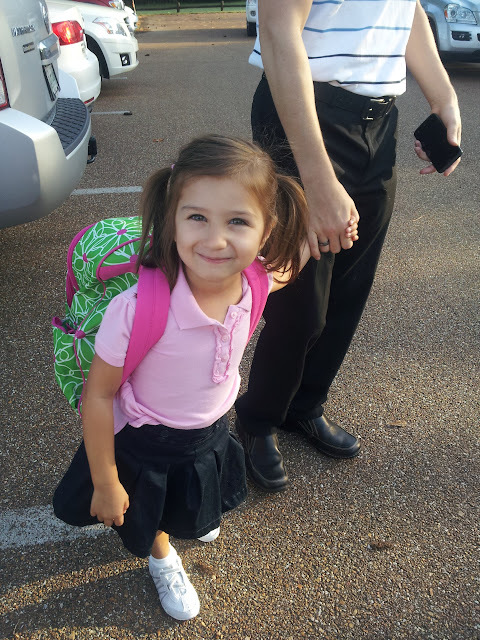 :) Check out who started school today! I didn't cry! I'm so proud of myself! It was completely tear free all around. I'm so proud of my big girl! Now that it's over, I'm really glad. The anticipation of school starting was worse than the reality for both Autumn and me. Autumn made it through the day with just one hiccup at lunch where she got a bit overwhelmed by the noise and kids but she moved on and it was simply part of the narrative of her day. I got a lot done, spent some time reading, and the fact that kindergarten was supposed to be when Garrett and I had some time together didn't really overshadow the day. Thank you all for your support and prayers through all of this!